The first snowfall thrills my soul. Growing season behind, Nature hides what garden work I’ve left undone under a vast, peaceful blanket. Pure. White. Cold. Should the first snow come after nightfall, I wake to a landscape erased of debris, a most glorious vision to behold. My shoulders relax. One of winter’s many benefits. “Rest and read,” says the land. First, I must make my tracks in the virgin stillness. “I’ll the do hen chores this morning,” I tell my husband. It’s entirely selfish. To hold warm eggs in my hands on a frigid morning is a celebration impossible on hot summer days. Food. Those little hens produce nourishment with such little effort on our part. Nothing like a fresh brood. Deer tracks zigzag across my black and white path uphill. Surfeited by countless shades of primary colors for months, the landscape’s austerity pleases my eyes. Swaths of snow cling to bark like gauze. The patches won’t last long. November is mercurial. I’m old enough to know. “Look up,” cries a jay. I stop. My jaw falls open as his blue feathers fly from the architecture of bare branches. These monochromatic designs remind me of Chinese art I studied briefly in a college art class. I kept the overpriced textbook titled Art Past and Present. It’s helpful to recall what I learned and promptly forgot twenty-four years ago. On this steel gray morning, what I see is darkness and lightness of a single color, what artists call “value.” The low value, darkness, changes to high value, lightness, depending upon atmospheric conditions, such as humidity and sun exposure. From a distance, the trees stand sleek and black, the branches filigree against white. Below, in a garden to the right, three small iron urns appear black holding snow mushrooms. 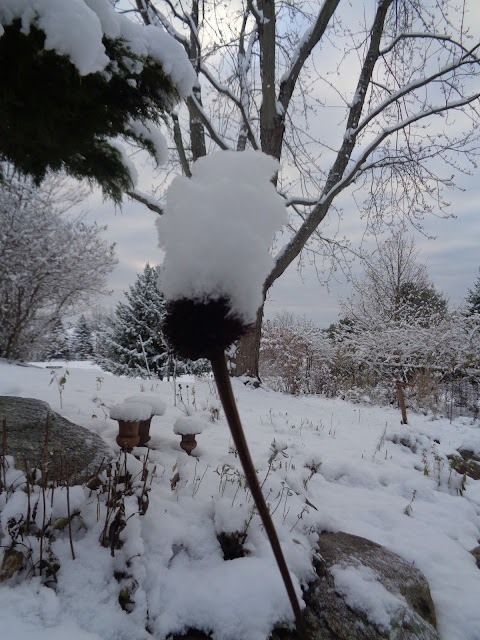 Climbing the steps, the black stem and seed head of a spent Echinacea bloom catches my eye. Layers of ice crystals balance high atop the thistle globe like French women wore their coiffeurs in the Eighteenth Century. Now a few yards away, the three urns reveal their natural rusty color. The closer, the higher and lighter the value. Value, an interesting word with a double meaning. This little plot of land holds a great deal of value for my husband and me. It’s much more than what the real estate is worth. This is our home, where we hope live our last days sowing seed and collecting eggs. When many of our peers are selling their large homes to downsize, we’re planning another fresh coat of paint for the interior of our little house. It seems this is the winter for choosing paint colors. We’ve had enough of the old low, dark values the past decade or so. Lightness with white ceilings is what we’d like to try again. Now, dear Reader, it’s time to settle into my reading chair before I begin moving furniture this week. I’m drawn to the values of black ink on a white page.